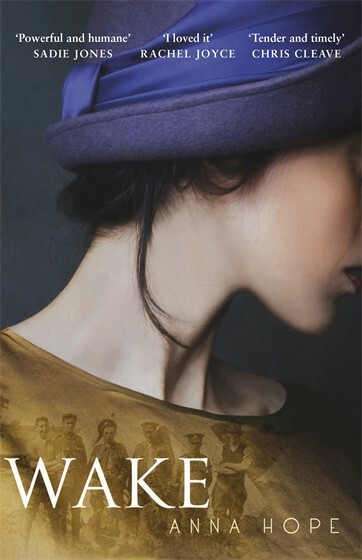 Anna Hope’s debut novel, Wake, depicts a mere five days in 1920 Britain but it’s an important period in the post-First World War world, covering as it does the repatriation of the Unknown Soldier from the battlefields of France to his final resting place at Westminster Abbey, and what happens in the lives of three women in London. Remembrance Day 1920: A wartime secret connects three women’s lives: Hettie whose wounded brother won’t speak; Evelyn who still grieves for her lost lover; and Ada, who has never received an official letter about her son’s death, and is still waiting for him to come home. As the mystery that binds them begins to unravel, far away, in the fields of France, the Unknown Soldier embarks on his journey home. The mood of the nation is turning towards the future – but can these three women ever let go of the past? Although Hettie, Ada and Evelyn initially seem to have little or nothing to connect them, connections slowly become apparent, the deeper into their stories and the novel you get. One of the things I liked best about reading Wake were those moment of revelation when I could see how these apparently random women, who might never meet each other, were, in fact, all linked. It helped to make the story feel more intimate in nature and reminded this reader of how we are all connected in some way to each other, and how our actions can have a ripple effect not only through the immediate circle of our friends and family, but also through that of wider society. It helped me see these women not solely in the context of living in a capital city but of perhaps living in a much smaller community than at first appeared. I also liked that we’re shown the ordinary lives of people and that those people are flawed human beings, trying to get through or get by, the best that they can in the wake of the Great War. The settings help with this. We move from Ada’s ordinary London street, which is replicated hundreds of times over in the capital, to the dance hall where Hettie sits in a pen, waiting for men to pay sixpence to dance with her, and on to the pensions and benefits office where Evelyn works her way through daily long queues of former soldiers. All three women come across as very human and real in their own way, which makes their stories and the novel as a whole all the more poignant for that. This is a beautifully evocative and moving story of life in Britain in that lull after the Great War. I think it’s an incredible debut novel and a book that fully deserves your attention. Wake is Anna Hope‘s debut novel and is published by Transworld Books. It’s out now in paperback and is available from the following online retailers: Amazon UK, Amazon US, Hive, The Book Depository and Waterstones. You can follow Anna Hope on Twitter. I received my review copy of Wake through NetGalley.